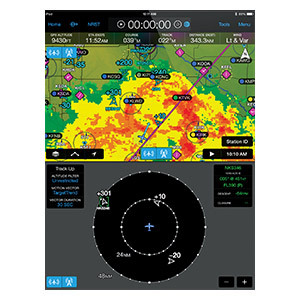 Access Automatic Dependent Surveillance - Broadcast (ADS-B) traffic and subscription-free weather on your aviation portable or mobile device with the GDL 39 ADS-B receiver. When using Garmin Pilot on your mobile device, the GDL 39 can provide highly accurate WAAS GPS data, while the GDL 39 3D can also provide backup attitude indication and SVX™ synthetic vision view. 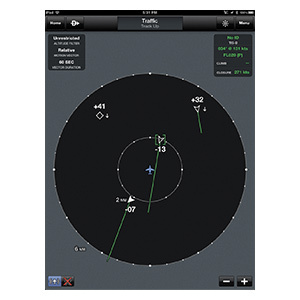 With Garmin Pilot on your mobile device, you can receive advanced traffic display features like TargetTrend™ relative motion tracking that provides a faster, more intuitive way of judging target trajectories and closure rates in relation to your aircraft's position. TargetTrend relies on ADS-B “Out” equipped targets, so while not all targets will display with trajectories today, this feature will be come increasingly beneficial to pilots in the future. TerminalTraffic provides pilots with the most comprehensive picture of ADS-B-equipped aircraft and ground vehicles in the airport environment. ADS-B-equipped aircraft in-flight are easily distinguished from ground vehicles and taxiing aircraft, which are displayed using distinct colors and symbols. ²Both the audible traffic alerting feature and TargetTrend™ require compatible displays. Check the Pilot’s Guide for specific capabilities available on your display. ³To maximize available traffic information for the display, the aircraft should also be equipped with a compliant ADS-B “Out” solution like the GDL 88 or GTX 330ES/33/23 ES transponders with a compatible WAAS position source. 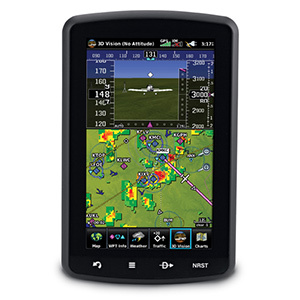 Visit the Garmin ADS-B Academy for more information.